You never learned as much taking a class as you did helping teach one, and I felt very lucky to do both with the incredible Bill Verplank and Andrew Singer for the Interaction Design Studio class at Stanford. I still draw stick men like Bill, and I'll now never lose the relentless focus on user-centeredness and design thinking that pervaded Terry Winograd's HCI curriculum. 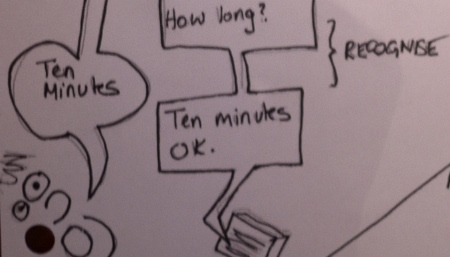 Somewhere in one of those classes I drew a nice cartoon illustrating a timer that used a recorded message instead of a beep when it was done, so you'd know what was finished. In my example the fish sticks were ready to come out of the oven (or fish fingers for us Brits), and the timer would yell "Fish Sticks! Fish Sticks!". From that point forward I was the fish sticks guy to Bill and Andrew. But the best project was when we were asked to create a device to allow one user to describe a lego model so that a second user could build it. While all the other students were struggling through late nights of 3D modelling and isometric projections, we simply hooked a video camera up to our Mac, coded a bit of HyperCard and QuickTime, and made a system where one person would record the model's disassembly layer by layer, and the second person would watch it in reverse so they could build the same model. It earned us a lot of angry looks from the rest of the class (and a creativity prize).